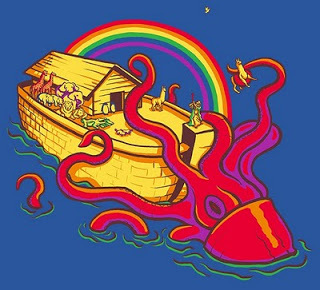 Noah's Ark/20,000 Leagues Under the Sea mashup, created by Ryan Long for a shirt sold by Woot.com. Used with permission. Let me tell you a story. The first story my father told me, and the first story I told each of you. Noah is, in part, a story about how we read stories. The line above is what Noah says to his family aboard the Ark, before he recites a version of the opening chapters of Genesis, the story of the world’s creation in six days. But as Noah tells the tale, the images that appear on screen could have come from Cosmos. The earth coalesces from space debris, and the moon is smashed out of it. Life originates as a single cell, then diversifies and expands. In a mix between stop-motion animation and morphing that manages to be linear without being Lamarckian, a fish grows legs, walks on shore and spawns lizards, snakes, early mammals, and an ape, which leaps forth from the trees into a blaze of light, and then we see Adam and Eve in the Garden. The creation account, we’re led to understand, is a story, and not an exact account of exactly how everything happens. Earlier, while Noah is reeling from a vision of the world’s destruction which came to him in a dream, his grandfather Methuselah explains to him, “You must trust that He [the Creator, as the film’s characters refer to God] speaks to you in a way you can understand.” Those two passages bookend the bulk of the story of Noah, and give us a guide about how Aronofsky wants us to read his story of Noah, and how he thinks we ought to read the earlier story (or, rather, stories, since there are lots of flood myths to go around). At various times, both Noah and the film’s villain (Tubal-Cain, a briefly-noted Biblical figure whose anachronistically simultaneous invention of bronze and iron tools earns him only one line in Genesis, but who Aronofsky fleshes out into at least a stock movie villain) stare skyward and ask why the Creator doesn’t speak to them or give them some sign. Tubal-Cain, Job-like, does this to seek clarity about what he should do with his kingdom of people, people whom the Creator has apparently consigned to drown without telling them why, or whether there’s anything they can do to save themselves. Noah’s request echoes Abraham’s on Mt. Moriah, before the sacrifice of Isaac. He’s decided that humans are not meant to live in the post-Flood world, since the Creator sent him and his sons onto a boat accompanied only by Noah’s wife (who we’re left to assume is post-menopausal) and the eldest son’s girlfriend (whose womb was destroyed by a childhood injury). But—SPOILER ALERT!—Methuselah blessed the daughter-in-law, healing her womb, and she is pregnant. DOUBLE SPOILER: She gives birth to twin daughters. Noah had sworn to kill any girl-child to ensure that God’s judgment on humanity would be carried out, and had convinced himself that he was chosen to build the Ark not because he was righteous enough to re-people the earth, but because he was righteous enough to ensure that no children would be born to his children. The arrival of twin daughters, however, suggests that maybe the Creator wants both of his unmarried sons to have wives as well. Knife bared over his newborn granddaughters, Noah pauses, stares up at the cloudy skies, and asks for guidance. But where an angel descended to tell Abraham to spare his son Isaac, the skies above Noah remain foreboding, filled with portents of either rain or a rainbow. In the end, he surrenders to love. He chooses to interpret that choice as a rebellion against the Creator, and when they leave the Ark he invents—and then surrenders to—wine. It’s a story, then, of fanaticism and its consequences. Noah thinks he’s been given clear signs that no new women should enter the world, and thinks that means he has to kill his granddaughters. If he were right, he’d be remembered like Abraham (assuming his hand was stayed, and there was anyone left to remember him), but if he were wrong, he’d be remembered (if at all), like Fred Phelps, Andrea Yates, or the Taliban. The Creator may speak to us in a way that we can understand, but Aronofsky’s message is clearly that we shouldn’t be too certain that we really do understand that message. Noah could just as easily have read his daughter-in-law’s pregnancy as a miraculous sign that humanity would survive, and never considered killing the children. The clarity of such stories and signs lies more in how we interpret them as it does in the raw text (which is why I hate and avoid the term “literalism”). Getting caught up in those particulars misses the crucial point, though. Stories about burnt offerings are how you’d communicate to a desert tribe a few millennia ago, but don’t speak to modern audiences. Aronofsky understands, as did the nameless multitudes who edited and emended the Biblical texts, that these stories are living things and have to change to match their listeners. Aronofsky’s Noah travels across un-Biblically industrial wastelands and leaves out the Biblical animal sacrifice because he’s telling the story to us, not our distant ancestors. And re-reading Genesis after watching the film, you can’t escape the realization that Noah is never promised that his family will re-populate the earth, not until after they land and make a thanksgiving sacrifice. Most modern tellings omit that uncertainty, and Aronofsky does well to bring us back to the angst Noah and his family had to feel at the possibility that they might be the last humans ever (e.g., Madeleine L’Engle’s Many Waters humanizes the doomed parts of humanity, but doesn’t leave any doubt that humans will survive after the Flood). And he humanizes the non-Noachians enough that the viewer is struck by the divinely-commanded genocide we know lies in their future. Could we see those crucial and shocking aspects of the story so clearly if he didn’t deviate from the text we’ve all gotten used to? Shouldn’t we, like the characters, be unsure how it’ll all turn out? into your hands they are given. All things crawling about that live, for you shall they be, for eating, as with the green plants, I now give you all. As for you—bear fruit and be many, swarm on earth and become many on it! The word “swarm” here seems significant. It’s a word used elsewhere to describe the movements of animals, and other translators render it as “slither and crawl” in those contexts. Humans have survived the Flood, but God is now talking about them as animals, not as the nearly-divine beings he made in the Garden. There has been a re-Creation through the flood, and humans are diminished in a sense, and more fully part of nature. The context of stewardship of the Earth, a theme Aronofsky pounds on, certainly runs through Genesis. Or at least through some people’s readings of it. When God grants Adam “dominion” over the Earth, and tells Noah to fill the Earth and gives all living things into his hands, does that mean the natural world is ours to exploit, or ours to tend to? Certainly, many Jews, Christians, and Muslims who read those words in their holy texts understand it to mean stewardship, and for good cause. Bill McKibben’s fascinating early book The Comforting Whirlwind traces those themes, especially in the Book of Job, where God’s oration from the whirlwind celebrates the wonders of nature, most especially natural wonder where there’s no human nearby to see it. This way of interpreting the Biblical stories sees the Creation as the goal of the Creator, and humans as just one part of that grand work. Others see the word “dominion” and see it as a clear sign that we are meant to dominate and control the Earth, not to tend and care for it as a good unto itself. Aronofsky weighs in firmly with the stewardship camp, and the precepts about reading stories that open and close his own story are part of an argument with those who favor the dominionism voiced by Tubal-Cain in the film. But they are also an acknowledgment that Aronofsky knows better than to insist that his is the only way to read Noah.